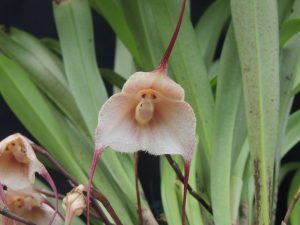 This Dracula species is native to cloud forests in Colombia at around 1800m altitude. As with most Draculas it is pollinated by fungus gnats and attracts them with a fake mushroom shaped lip. This also give the ‘Monkey Face’ look shared by a number of species. We grow the plant in Cool Americas but find we need to give a few Dracula specific conditions for the plant to flourish. Firstly it needs to be grown in a basket (as you can see here) as many of the flowers grow downwards from the base of the leaves. Secondly it enjoys being very damp and heavily shaded. We find that the easy way to provide these conditions is to hang the dracula’s basket below another plant in a basket providing shade and added moisture. The level of moisture is shown by the natural growth of moss on the basket. The final requirement is to avoid high temperatures which cause brown patches on the leaves and leaf drop. 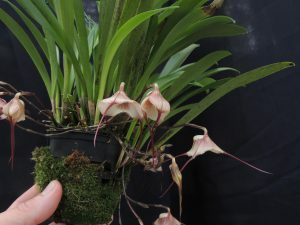 This is also helped by hanging below another plant as the dracula is at around waist height and not it the warmer air near the top of the greenhouse. This all sounds quite complicated but as you can see the plant grows very happily when it likes its spot and we have twenty flowers or buds on the plant this morning. This species is definitely one for ‘goths’! I think Draculas are rather fun and I really love the monkey face. Apart from Dracula Amalie, Deloidea and Bella, which are on your website, are there any other Draculas? The species definitely causes a stir. There are currently 141 recognised species.